Having suffered five days of heavy snowfall in Edinburgh I’ve had to give up my daily cycle into work. This is disappointing as I’ve always enjoyed the journey, but it would have been bonkers to try. For the last three days I drove to work, but this was slow and frustrating and I decided to walk today. There is a cycle path on an old railway line that runs from behind our house to near my work and, with lots of newly fallen snow, I knew this walk would be more satisfying than digging out the car and driving again. If nothing else, it was an opportunity to talk about stout walking books and gaiters (what a lovely agricultural word). I set off off dressed as a mixture of old-school arctic explorer (Snowsled Ventile cotton jacket) and modern commuter (iPod and earbuds) and was soon trudging through the snow on the deserted cycle path. The experience of walking through fresh snow is fantastic, either enjoying the silence or listening to music, feeling the snow compress beneath each step. In my case I was listening to the unworldly cello music of Zoë Keating’s Into The Trees album (particularly the haunting track Hello Night) was the perfect accompaniment to the walk. What was really striking was just how quiet and beautiful it was. This was the busiest time of day for people travelling to work but I only saw two cyclists and one cross-country skier. 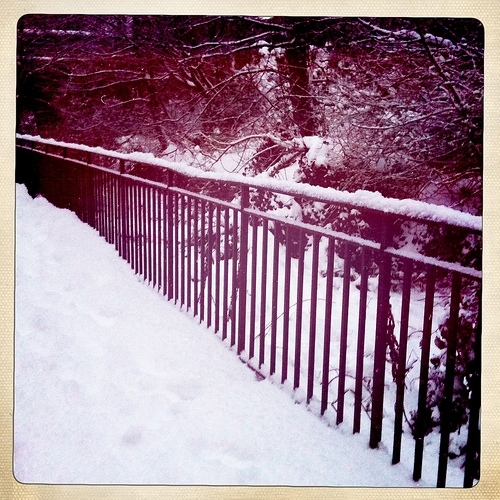 Of all the possible choices to cross Edinburgh that day the most sensible choice was the skis!